Date Night has dinner with…strangers. We are at a food blogger dinner organized by Grant and Marie from Marie Let’s Eat. Can you get anything you want at Alison’s Restaurant? Read on to see what’s on the menu. Alison’s is what we would call a neighborhood restaurant. It’s in a non-descript shopping center in “Downtown Dunwoody”, right behind the Hickory House. Also joining us for the meal is Leslie from The Food and Me. 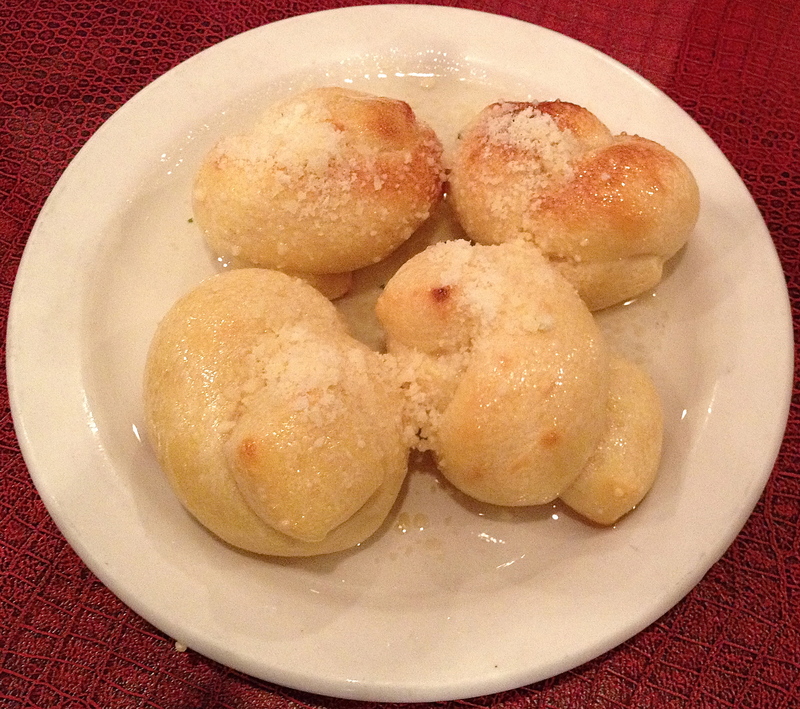 As we get to know each other, we are served a plate of parmesan-garlic knots. Knotty rolls start us off. We must have been hungry because these quickly vanish from our plates. Of course we order our customary beers. Served in a nice cold glass, Sweetwater Georgia Brown is very local and is brewed less than ten miles from here. 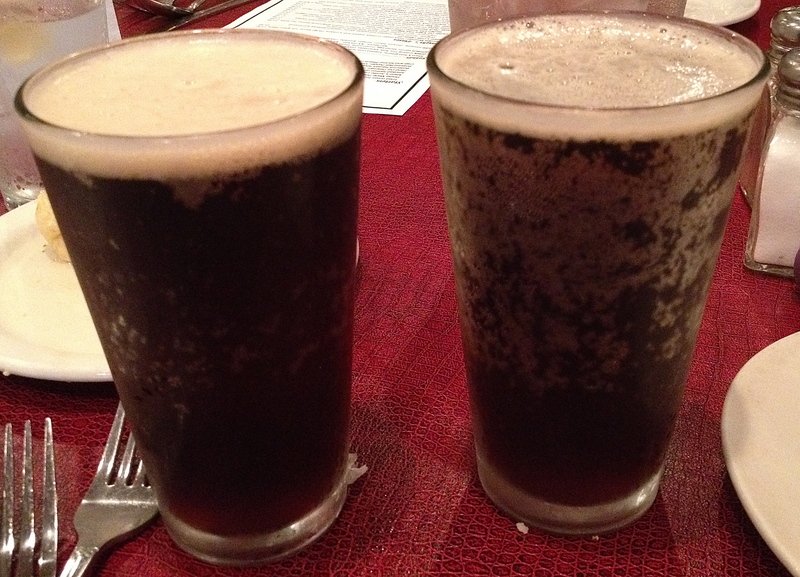 It’s one of our favorite Sweetwater offerings, nice and malty, with a touch of coffee flavor. Leslie orders a fried green tomato appetizer, which she shares with the table. The breading is nice and crunchy around the soft tomato center. It is not pictured here in case she wants to blog about her meal in a future entry. We go right to the dinner menu. You can get a lot of things at Alison’s Restaurant, especially if you like Southern comfort food. There’s lobster mac and cheese on the menu as well as meatloaf that should fill you up. 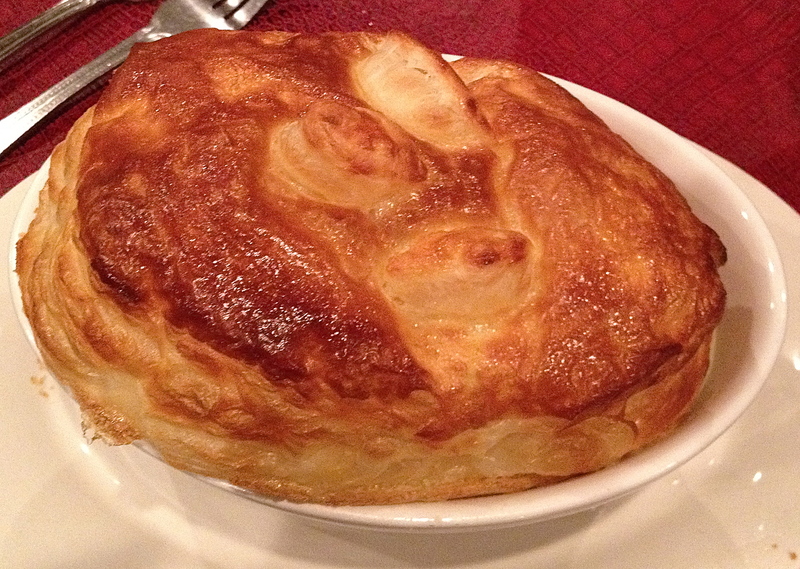 Once you see a pot pie go by your table, you must order one. Tonight we have the choice of chicken or shrimp. Pot pie to die for. I stay traditional and go with the chicken. It’s full of chicken chunks, peas and carrots in a creamy sauce. The crust is gorgeous and it almost hurt to stick a fork in it. Eve loves her Georgia mountain trout and orders the Alison’s version. The fish comes with a side of rice and a large helping of green beans. It’s moist and flavorful. 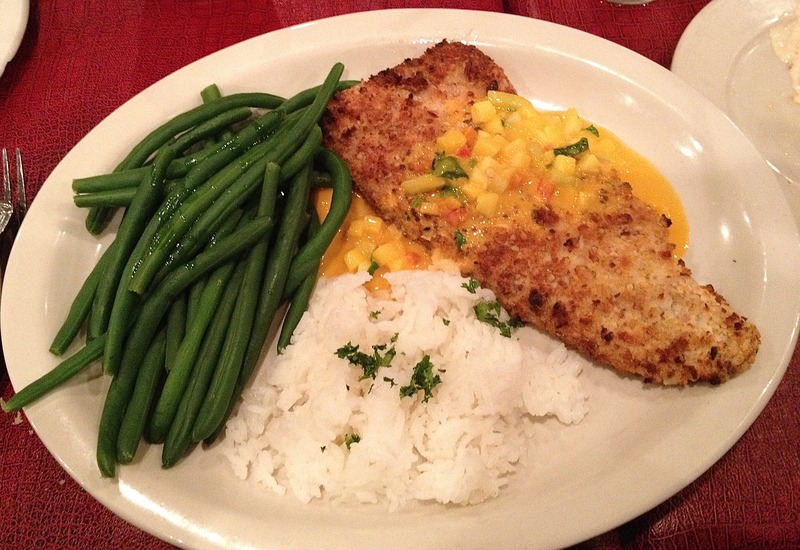 The star of the plate is the mango sauce that comes on the fish, featuring large cubes of mango in the sweet sauce. When you have dinner with bloggers, every dish is a photo opportunity. Everyone takes pictures of our food, but we just ogle theirs. Grant gets the salmon, which turns out is based on a family recipe of Alison’s. Marie orders the pot pie and Leslie gets the buttermilk fried chicken, which looks nice and crispy. Speaking of Alison, she’s right there in the restaurant, scooting by on her crutch on wheels. She’s recently sprained her ankle, but it hasn’t slowed her down. She’s a constant presence in the dining room, asking if everything is good in her wonderful English accent. Since we didn’t have an appetizer, we feel we can order dessert. It’s apple season, so we order the apple pie and five spoons. It has fruit in it. It must be good for you. It comes with whipped cream and caramel sauce. 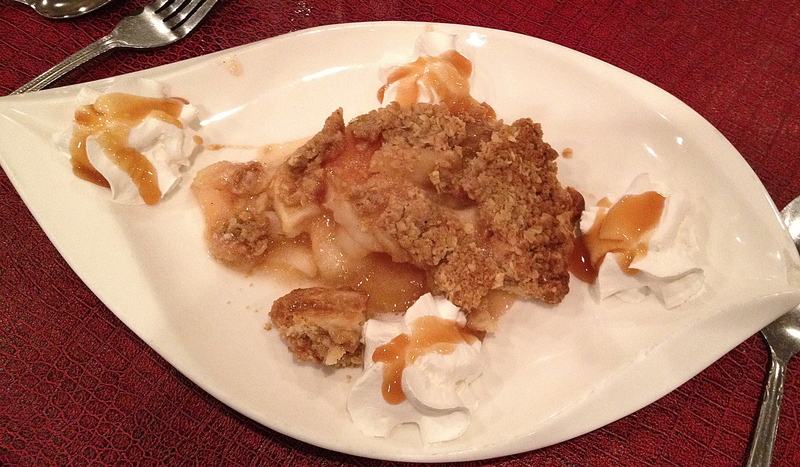 This is a very enjoyable dessert and a great way to end our meal at Alison’s. The bottom line on Alison’s: Evidently, you can get anything you want at Alison’s Restaurant. It’s right there on the bottom of the menu. You probably won’t find Alison’s on any “Best of Atlanta” lists, but as a neighborhood restaurant, it’s a nice place to go. 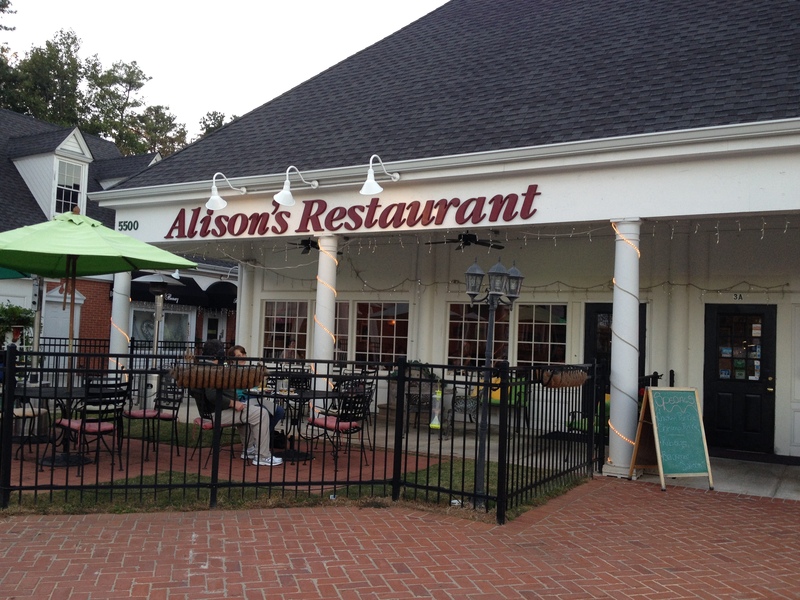 If you are a “Dunwoodian”, you should check out Alison’s for a good meal.